This paper reviews the state of knowledge on social vulnerability to climate change in three hot spots (deltas, semi-arid regions and snowpack- or glacier-fed river basins) in Africa, Central Asia and South Asia, using elements of systematic review methods. Social vulnerability is defined as a dynamic state of societies comprising exposure, sensitivity and adaptive capacity. We examine whether the hot spots have specific characteristics that tend to increase or decrease social vulnerability, consider suitable scales of analysis for understanding vulnerability, and explore the conceptions of vulnerability adopted in the climate change literature and the nature of the insights this generates. Finally, we identify knowledge gaps in this literature. All three hot spots are characterized by high levels of natural resource dependence, with increasing environmental degradation. They also exhibit unequal policies and patterns of development, which benefit certain segments of society while making others more vulnerable. Vulnerability is driven by multiple factors operating at different scales; however, characterization of cross-scalar interactions is poorly developed in the majority of studies reviewed. Most studies are either large scale, such as broad comparisons of vulnerability across countries, or local, documenting community-level processes. Detailed understanding of the interactions between climate change impacts on natural systems, and socio-economic trajectories, including adaptation, also emerges as a knowledge gap. The online version of this article (doi: 10.1007/s10113-014-0741-6) contains supplementary material, which is available to authorized users. This paper is one of seven commissioned by the Collaborative Adaptation Research Initiative in Africa and Asia (CARIAA) to explore the current state of knowledge on climate adaptation in three climate change ‘hot spots’ (De Souza et al. this issue). CARIAA defines hot spots as ‘geographical area[s] where a strong climate signal is combined with a large concentration of vulnerable, poor or marginalized people’. The selected hot spots are semi-arid regions, deltas and glacier- or snowpack-dependent river basins. De Souza et al. (this issue) provide an overview of climate change issues in each hot spot and the rationale for hot spot selection. This review examines the state of knowledge found in climate change-related literature (see below for how this is defined) on social vulnerability in these hot spots, using elements of a systematic review approach. While recognizing that an extensive literature exists relating to the social, economic and political factors which underlie vulnerability, here we are concerned with the depth of knowledge found in the literature which explicitly refers to ‘climate’ or ‘adaptation’, as this is most likely to be that used by adaptation decision-makers. The review analyses 87 high-quality articles published since 2006 (see ‘Methods’ section). An overarching question guides the analysis of content: are there specific characteristics of the hot spots that are identified as increasing or decreasing social vulnerability, and which aspects of vulnerability are poorly characterized in the climate-related literature? This is complemented by an exploration of the conceptions of vulnerability and scales of analysis used, and the extent to which they capture various dimensions of social vulnerability. Lastly, we consider which aspects of vulnerability are explicitly identified as research gaps and reflect on what this means for the possible direction of future scholarship in this area. A systematic review has been defined as a ‘focused review of the literature that seeks to answer a specific research question using a set of standardized techniques and explicitly outlined methods’ (Berrang-Ford et al. this issue). At the heart of the systematic review approach is the use of explicit and transparent methods for data selection and analysis, to avoid hidden bias in the inclusion of evidence, and to enable replication. The term ‘systematic review’ has been in widespread use since the 1990s in the health sciences. It has generally been used to refer to statistical meta-analyses aimed at testing a particular hypothesis (of the form ‘does x treatment for y condition work?’), following the Cochrane guidance for formal research synthesis issued in 1989. Many consider this to be the definition of a true systematic review. However, others have argued for the recognition of a wider range of approaches under the label of a systematic review, making the case that systematic data selection and methodological transparency can still be applied in more qualitative reviews, which seek to answer exploratory (rather than simple hypothesis-testing) questions. The Campbell Collaboration, for example, publishes systematic reviews which provide evidence on the effectiveness of policy interventions in crime and justice, education, social welfare and international development. While still adopting a primarily formal quantitative approach, its guidelines also provide for the inclusion of qualitative research, in particular to address questions about why and under what conditions interventions are effective. Berrang-Ford et al. (this issue) identify at least three types of systematic review, which do not conform to Cochrane guidelines but nonetheless adopt explicit and transparent approaches to data selection and analysis: (1) meta-syntheses, which use theory-driven analysis and inductive reasoning rather than statistical analysis of aggregated data to answer explanatory questions (whys and hows); (2) realist reviews, which again use theory-based analysis to explore complex or interdisciplinary questions and usually take a more iterative approach to data identification than database searches alone; and (3) qualitative comparative analysis, which uses formal statistical analysis to analyse the results of multiple qualitative studies. They argue that rather than being limited to a single method, systematic review should be seen as a process founded on transparent, explicit approaches to: (1) identification of research questions and the scope of analysis; (2) document selection procedures; and (3) data extraction and analysis. The research questions have been defined as stated above. The geographical scope is defined by the CARIAA list of priority countries across the three hot spots (see De Souza et al. this issue), and the temporal scope is limited to documents published from 2006 onwards (because the IPCC reports published in 2006 were included and should represent an authoritative summary of the state of the knowledge up to 2005). Document selection was based on a combination of database searches, citation tracking and expert judgement. Initially, a set of authoritative keystone documents were identified using database searches and expert knowledge. Citation tracking was conducted from these keystone documents, using an explicit set of criteria to select documents for inclusion in the review. Gaps in thematic or geographical coverage (as defined by the research question and scope of the review) were filled using targeted database searches and expert consultation with colleagues and contacts with knowledge of specific regions or sectors. Citation tracking and expert knowledge have been found to be efficient approaches to identify documents, in comparison with database searches (Greenhalgh and Peacock 2005; Booth 2006), and there is precedent for their use in systematic reviews, broadly defined (Ford et al. 2010a). Data extraction was guided by an extraction form, using categories based on the conceptual framework (see below) and the research questions described above; the categories are further detailed below. Analysis and synthesis were similarly guided by these frameworks and can be considered at least semi-systematic. A similar theory-based approach to data extraction has been demonstrated in systematic reviews of vulnerability by Ford and Pearce (2010) and Thompson et al. (2010). By adopting these elements of a systematic review, we sought to provide greater transparency and replicability than found in a traditional literature review and to explore what value is offered by such approaches, which are still relatively novel in the social sciences. This review focuses on the literature which self-identifies as research related to climate variability and change. There is a wealth of other literature which would provide insights into social vulnerability (for example, research on livelihoods, human–environment interactions, poverty and sociopolitical systems), and we recognize that these will not be captured here. However, our primary aim was to explore how social vulnerability is understood by the climate change and adaptation communities. Only the literature which explicitly referred to climate variability or change, or to specific climate-related hazards such as water resources variability, and to vulnerability or related terms, was included. We recognize the extensive scholarship on definitions and conceptual frameworks relating to vulnerability and the contributions from related fields such as entitlements theory and disaster risk reduction. Here we draw from widely recognized definitions of the key concepts, principally those adopted by the Intergovernmental Panel on Climate Change (IPCC). The IPCC conceptualizes vulnerability as a function both of the state of social systems and the nature of biophysical climate change effects which they face (IPCC 2007). This article deals with social or contextual vulnerability, i.e. those characteristics of social systems which make them more or less vulnerable. Future biophysical changes in the three hot spots—the biophysical aspects of vulnerability—are dealt with by Kilroy (this issue). Social vulnerability is dynamic in time and space and may increase or decrease in response to government policies and investments, external shocks, stresses or opportunities (environmental, economic, political) and the aggregate effects of people’s daily actions (e.g. migration, diversification, investment and divestment, natural resource exploitation or conservation, conflict or cooperation and establishment and maintenance of networks and institutions) (Adger et al. 2009a; Eakin et al. 2009). Different groups or households in the same location may experience very different levels of vulnerability. For this analysis, we understand vulnerability as a function of three components: exposure, sensitivity and adaptive capacity, in line with the third and fourth IPCC assessment reports (IPCC 2001, 2007). Exposure is defined as ‘the extent to which a given system is exposed to climate change-related hazards’ (IPCC 2007). It has both a biophysical dimension (the frequency and severity of climate impacts) and a social dimension (the spatial distribution of populations and assets, e.g. infrastructure, croplands and livestock). Here, the social dimension is the focus. It is determined by where people live and work and how they construct their livelihoods. Sensitivity is defined as ‘the degree to which a system is affected, either adversely or beneficially, by climate variability or climate change’ (ibid.). Effects may be direct or indirect. Determinants of sensitivity include the extent of dependence on natural resources, age and health status of the population and access to alternative livelihoods. Exposure and sensitivity are often considered together in the literature as ‘exposure-sensitivity’. Adaptive capacity is defined as ‘the whole of capabilities, resources and institutions to implement effective adaptation measures’ (adapted from IPCC 2007). Adaptation to climate change is defined as ‘adjustment in natural or human systems in response to actual or expected climatic stimuli or their effects, which moderates harm or exploits beneficial opportunities’ (IPCC 2007). Determinants of adaptive capacity include assets, institutional arrangements and entitlement security, knowledge and information, ability to innovate and the presence of flexible, forward-looking governance (Levine et al. 2011). The literature was identified through a two-stage process. The first stage involved citation tracking from ‘keystone’ texts identified for each hot spot (Online resource 1). Keystone sources were identified using a combination of Web of Knowledge (WoK) searches and expert knowledge and were generally review papers or authoritative research papers with an international scope (national studies were included for some large countries, e.g. India, or for countries which were not otherwise covered). Keywords used for WoK searches were related to: (1) the hot spot type [including variants such as ‘drylands’ and ‘coastal’ followed by a relevance check]; (2) the names of regions and countries, as per the CARIAA classification; and (3) ‘vulnerability’ and associated terms (‘exposure’, ‘sensitivity’, ‘adaptive capacity’, ‘adaptation’, ‘resilience’). Many combinations were tried to yield the most relevant results. The selection aimed to provide balanced coverage of all relevant subregions within each hot spot. Due to the larger number of CARIAA countries which include semi-arid regions (see De Souza et al. this issue), more keystones were chosen for this hot spot than others. The keystone text approach was followed because excessive numbers of results were identified from trial keyword searches. Although such methods do not exhaustively identify all relevant texts, the limited number of highly relevant documents selected permits an in-depth critical analysis suited to the complex, qualitative nature of this subject and is not unusual for realist-type reviews of this nature (Berrang-Ford et al. this issue). Standard criteria were used to include/exclude documents from consideration (criteria are shown in Table 1). WoK was used to track citations, as it is one of the most comprehensive and up-to-date search engines available for this purpose (Berrang-Ford et al. 2011; citing Jasco 2005). Exceptions were made only for reports from the IPCC Fourth Assessment, which are not available through WoK. The IPCC reports should represent an authoritative review of the state of knowledge primarily up to 2005, so this review identified articles published from 2006 onwards. Only high-quality articles were considered for inclusion. This means that priority was given to peer-reviewed literature, with grey literature included only where highly relevant and necessary to fill gaps. Grey literature was only included if produced by a reputable organization and if articles provided sufficient and convincing information on methods and data sources to justify their conclusions. Backward and forward citations from the keystone texts were screened first (by title, abstract and if needed, full text), and further stages of citation tracking carried out from documents selected for inclusion, using the criteria shown in Table 1. Initially, two stages of forward tracking were carried out, with further stages added if necessary to reach thematic and geographical saturation or until the search was exhausted (this occurred in the case of the river basins hot spot). The second phase of the literature identification used the same inclusion criteria but drew on expert knowledge (consultation with senior researchers in the field) and targeted searching of bibliographic databases [WoK, Google Scholar], using specific country names, sectoral terms (e.g. ‘agriculture’) and scale terms (e.g. ‘community’), to fill thematic and geographical gaps. Altogether, these methods generated a total of 87 articles for review (33 for deltas, 26 for semi-arid zones and 28 for river basins). Information relating to the research questions, as well as key document characteristics, were systematically extracted and recorded for analysis using a simple Excel form. Headings for data extraction were as follows: location of study; methodology employed; framing of vulnerability employed; scale of analysis; hot spot features tending to increase or decrease exposure; hot spot features tending to increase or decrease sensitivity; hot spot features tending to increase or decrease adaptive capacity; vulnerability differences between hot spot locations; vulnerability differences within hot spot locations; any comments from the text on scales of analysis for vulnerability; and research gaps identified by the text. The methods used presented certain limitations. First, the keystone document and citation tracking approach to literature selection inevitably may have biased the first round of literature identification, although the inclusion of a second round of targeted searches aimed to address this by filling any gaps. Second, certain documents not present in WoK and most of those not written in English will have been missed (a small number of French language articles were included in the second round of the search for deltas, in order to address the underrepresentation of West African deltas in the first round). The following sections present and discuss the results of the analysis. Two different epistemological paradigms exist in vulnerability research, which are used according to the objective in question. The first, ‘outcome vulnerability’ (O’Brien et al. 2007), has grown out of various risk-hazard and impact frameworks (Füssel and Klein, 2006). It focuses on environmental impacts and then brings in social parameters. The second, ‘contextual vulnerability’, originates from the literature on entitlements and livelihoods rooted in social systems (Ellis 2006; Sen 1982) and focuses primarily on social stressors, exacerbated by environmental ones, emphasizing aspects of inequality and distribution (Adger et al. 2009b). The studies selected here draw on both paradigms, sometimes combining them. The most commonly used theoretical framework appears to be that promoted by the IPCC (vulnerability as a function of exposure, sensitivity and adaptive capacity) or variations of this. Some authors (e.g. Johnson and Hutton 2012) remove exposure from their analysis, on the basis that many regions are data-poor and the hazard itself is unlikely to vary significantly in magnitude in a given place and time. Others do not draw an explicit distinction between these components of vulnerability, but present frameworks grounded in theory of the underlying drivers of vulnerability. For example, Fraser et al. (2011) propose that vulnerability comprises (1) resilience of the agro-ecosystem; (2) socio-economic affluence; and (3) institutional capabilities. Others adopt the livelihoods framework as a proxy for vulnerability, sometimes also incorporating examination of institutional factors (e.g. Brockhaus et al. 2013; Sall et al. 2011). Some, such as De Stefano et al. (2012: 2), prefer the concept of ‘resilience’, defined as the ‘ability of system to absorb perturbations without altering the fundamental structure, functions and feedbacks of both its ecological and social components’. This term has its roots in ecology, and indeed, the intimate link between ecological sensitivities and social vulnerability is emphasized by several authors, across all hot spots but particularly in semi-arid regions, due to the close dependence of livelihoods on ecosystem processes, the sensitivity of particular agro-ecosystems and, in many cases, the absence of strong political responses to assist livelihood diversification and adaptation away from these direct ecological dependencies. In this framing, vulnerability is seen as a state of coupled socio-ecological systems and the distinction between outcome and process vulnerability becomes less clear (e.g. Dougill et al. 2010; Maestre et al. 2012; Vetter 2009). This diversity of definitions and conceptual framings is symptomatic of the ongoing theoretical debates in the wider climate change literature where historically intellectual traditions have used terms such as vulnerability, resilience and adaptive capacity in different, and sometimes incompatible, ways, although they appear strongly related (Gallopίn 2006; see also Smit and Wandel 2006; Adger 2006). Five broad approaches were identified in the literature reviewed, each of which offers a different yet complementary set of insights. These categories are not mutually exclusive, and some papers include elements of more than one approach. First, indicator-based assessments attempt to quantify the vulnerability of geographical units (e.g. countries, basins, cities) and may compare scores across multiple locations. Indicators vary between studies, and as they are proxies for vulnerability to future changes, it is not possible to test the validity of indicator sets. A review by Eriksen and Kelly (2007) found that the choice of indicators greatly influences the resulting rankings, and composite vulnerability scores alone are not particularly informative. However, the underlying analysis does tell us about the relative importance of different drivers in different locations. For example, studies comparing river basins in South and Central Asia find that vulnerability in the Indus basin relates mainly to extremely high water stress (Varis et al. 2012), while in the Amu Darya and Helmand basins, vulnerability is driven by weak governance and economic status as well as environmental pressure (Varis and Kummu 2012). Nested analyses at multiple levels provide finer detail (e.g. Pandey et al. 2009, 2011). However, they still mask heterogeneity in vulnerability between households, which can be considerable (Thornton et al. 2006). A second group of studies provide similar analysis or comparisons but do not use indicators or develop rankings; rather they identify a range of environmental, economic, social and political factors and describe how they vary across locations (e.g. Moench 2010) or between or within groups (e.g. Brouwer et al. 2007; Pouliotte et al. 2009), using a mixture of qualitative and quantitative data. Such studies tend to provide richer detail on the underlying drivers of vulnerability. For example, Lioubimtseva and Henebry (2009) explain how the different histories, institutions and geographies of Central Asian countries shape their current vulnerabilities. Pouliotte et al. (2009) describe how interactions between environmental, political and economic conditions and pressures have led to adjustments in resource use systems and altered livelihood opportunities, ultimately increasing the vulnerability of poor villagers. In both this group of studies and the indicator-based type discussed above, vulnerability is treated as an existing state of social systems. Thirdly, some studies take an endpoint or outcome-based approach to vulnerability (see O’Brien et al. 2007), characterizing likely biophysical impacts of climate change in a given location and then assessing possible effects on human systems. Many focus primarily or exclusively on exposure, e.g. Nicholls et al. (2008a) assess exposure of coastal urban infrastructure to storm surges. Some provide more discussion of sensitivity and adaptive capacity across groups (e.g. Cinner et al. 2012), but this often stops at generic statements about the poor being most vulnerable. The fourth type analyses the impact of past hazards and characterizes local coping strategies. Khan and Salman (2012) compare the severity of flood impacts across locations in Pakistan, for example, and identify the factors which enable people to avoid or recover from damage. Brouwer et al. (2007) analyse impacts of flooding on households in Bangladesh and identify household and community-level characteristics associated with both exposure and the ability to prepare and/or cope. Such ‘temporal analogue’ studies give us the most direct measure or test of vulnerability (see Ford et al. 2010a, b). By their nature, they are focused on past or existing climate variability rather than future risks, but the vulnerability factors they explore will likely be relevant to both. Finally, some studies build on assessments of current vulnerability and model future vulnerability under different socio-economic scenarios. Dougill et al. (2010), for example, qualitatively characterize vulnerability dynamics of different groups in the Kalahari, and then model quantitatively how vulnerability drivers might evolve under changes in the availability of pasture, livestock prices and other scenarios. Summary tables of some characteristics of the literature identified are provided as Online Resources 2 and 3. This section discusses to what extent specific characteristics of the hot spots can be identified that tend to increase or decrease social vulnerability (in terms of exposure, sensitivity and adaptive capacity), according to the literature reviewed. Certain hot spot-specific features emerged from the analysis, discussed below for each hot spot in turn. Online Resource 4 summarizes the main vulnerability drivers identified in articles on each hot spot. Deltas are exposed to both incremental and extreme climate impacts (Dasgupta et al. 2011). Incremental impacts include sea-level rise, changes in seasons and precipitation patterns, and land salinization (Nicholls and Cazenave 2010). There is also exposure to increased frequency and severity of extreme events such as cyclones and floods (Nicholls et al. 2008b). The studies reviewed concur on the main indicators of exposure in these deltas, including: highly exposed low-lying lands; densely populated environments experiencing rapid growth and urbanization; concentration of economic and commercial activities, as deltas are important environmental and economic hubs; and high value assets on the coast (including infrastructure, productive land and livestock, urban centres, fisheries and coral reefs). The Nile and South Asian deltas in particular are important economic and commercial centres that host millions of people (Seto 2011), but less well-known deltas also have high exposure, illustrated by the 60,000 lives lost during flooding in Kenya in 2006 (Cinner et al. 2012). Exposure of delta cities and other coastal areas is exacerbated by rapid development, often unplanned, which concentrates populations in these areas and often undermines natural coastal protection (Chan et al. 2012; Odufuwa Bashir et al. 2012; Revi 2008; Dossou and Glehouenou-Dossou 2007). These factors are found to varying degrees in most of the deltas in South Asia and Africa. Different aspects of exposure are highlighted in the literature available on specific deltas. For the Nile, vulnerability assessment is primarily based on biophysical indicators, projections of sea-level rise and their effects on coastal infrastructure (ElRaey 2010) and tourism (Tekken et al. 2013). Research on Eastern African deltas such as in Tanzania and Mozambique deals with both the direct and indirect impacts of climate change and variability on the population and economic activity (Bunce et al. 2010b). The 2006 floods in Kenya have triggered interest in studying the direct effects of extreme events on coastal populations and infrastructure in the region (Cinner et al. 2012). Research also covers the indirect impacts of sea-level rise such as water logging, salinization and impacts on marine ecosystems and their implications for the livelihoods of farmers and coral reef fishermen (Ibid). Sensitivity factors heightened in deltas include high levels of livelihood dependence on natural resources, which are under pressure from rapid development, especially within the farming, fisheries and tourism sectors (Nicholls et al. 2007, 2008b; Tekken et al. 2013; Vermaat and Eleveld 2013). Some sensitivity characteristics are specific to the ecological character of particular deltas and the associated livelihoods of their communities. Deltas in Kenya, Tanzania, Nigeria, Madagascar and Morocco are characterized by their ecosystem diversity (Akinro et al. 2008; Bunce et al. 2010b; Tekken et al. 2013). Their mangrove forests, grasslands, beaches, dunes, lakes, swamps and water channels provide a range of ecosystem services and livelihood opportunities, and the combined impacts of incremental and extreme climate impacts (sea-level rise, seasonal changes, droughts and floods) on these affect farmers, herders, fishermen and people working in the tourism and forestry sectors (Cinner et al. 2012). Herders, forest-dependent communities and coral reef fishing communities are identified as particularly vulnerable. Fishermen in the Betsiboko delta in Madagascar, for example, face climate-related threats to endemic, specialized delta fish species on which they depend (ibid.). The Volta delta has high sensitivity due to underlying poor soil fertility (Westerhoff and Smit 2009), while in the South Asian deltas, intensive land use and coastal development have increased the vulnerability of those dependent on increasingly marginal natural resources (Chan et al. 2012; Seto 2011). In the Nile and Orange deltas, dependence on irrigation for food production and hydropower for energy creates sensitivity to changes in blue water availability (Glavovic and Boonzaier 2007; Malm 2012), while areas with predominantly rain-fed production are more sensitive to changes in rainfall (Akinro et al. 2008; Bunce et al. 2010b; Nzeadibe et al. 2011). The risk of violent conflicts over access to natural resources which are also threatened by climate stresses has been highlighted in regions of the Zambezi delta, but sensitivity to resource-related conflict is found to be mediated by the compounding effects of socio-economic stresses (such as rising food prices and polarized social identities) and poor governance (Swain et al. 2011). Finally, structural economic reforms in recent decades have concentrated development in deltas, which simultaneously created exposure in deltas themselves and effectively made the surrounding hinterlands more sensitive to climate impacts as they depend on highly exposed deltas for food supply and economic and trading links (Nicholls et al. 2007, 2008b; Tekken et al. 2013; Vermaat and Eleveld 2013). Deltas in the North African drylands, for example, provide islands of irrigation and soil fertility, and so are highly productive for crops which form the backbone of economies (e.g. cereals, citrus fruits, rice and cotton) (Malm 2012; Tekken et al. 2013). The importance of international value chains for economic development in deltas means that global market trends can exacerbate sensitivities (Ericson et al. 2006; Nicholls et al. 2007). Most discussion of adaptive capacity in the literature on deltas in Africa and south Asia is found in livelihood-based studies which consider the effect of multiple stressors in creating social vulnerability and triggering adaptation (e.g. Bunce et al. 2010b; Hassani-Mahmooei and Parris 2012; Swain et al. 2011). Subsistence farmers and fishing communities are usually the focus of these community-level studies (Aphunu and Nwabeze 2012; Malm and Esmailian 2012; Sall et al. 2011). This work highlights the importance of livelihood diversification, as in the other hot spots, but also the potential for local innovation in natural resource-based livelihoods, when social networks and local knowledge are strong. In the Niger delta, fishing communities are providing flood protection and shades for their ponds, and actively seeking climate change information, for example (Aphunu and Nwabeze 2012), while in Benin coastal communities have sought to develop, test and implement new farming strategies and to share these in partnership with government and meteorologists (Dossou and Glehouenou-Dossou 2007). Arguably, the high awareness of climate risks often found in deltas can enhance adaptive capacity. However, the intensive development of many deltas also limits the adaptation options for poor subsistence communities, as land and water resources becomes constrained; this has been termed ‘the coastal squeeze’ (Bunce et al. 2010a; Chan et al. 2012; Glavovic and Boonzaier 2007; Nicholls and Cazenave 2010; Seto 2011). In this context, access to land and other resources form a critical component of adaptive capacity, but these rights are not always secured or well governed (Glavovic and Boonzaier 2007; Hassani-Mahmooei and Parris 2012). Nevertheless, the need for an active approach to adaptation within government is increasingly being recognized, and several authors refer to active adaptation policies coming into place for delta areas (Akinro et al. 2008; Bunce et al. 2010b; Fuchs et al. 2011; Nzeadibe et al. 2011). According to Akinro et al. (2008), in Nigeria, climate change is increasingly being recognized as a development threat to the achievement of the millennium development goals and is prompting assessment and adaptation efforts on the part of climate change, environment and development experts and policy-makers. For low-lying urban coastal zones in Asian populated deltas exposed to climate-related stresses and risks, Fuchs et al. (2011) point out that the urban planning and environment policy community are starting to develop assessment studies and effective responses to address vulnerability and adaptation to climate change threats, stresses and risks. In India, the devastating 2004 tsunami in particular led to greater recognition of the need for integrated coastal management, with new management plans having been developed for coastal areas (Revi 2008). Thornton et al. (2009) report that two of the most vulnerable agricultural systems in agriculture are semi-arid rangelands and semi-arid mixed rain-fed systems, validating the selection of this hot spot by the CARIAA programme. Exposure is not given a strong focus in the documents reviewed on semi-arid areas, probably due to the ambient and long-term nature of the most frequently considered climatic changes (temperature and rainfall change), though exposure to flood is also considerable. The literature highlights that semi-arid and arid regions are home to some 2.5 billion people globally (Fraser et al. 2011), and that population growth rates are generally high in semi-arid Africa and South Asia, at 2–3 % in the Sahel for example (Mortimore 2010). Population growth is also high in some central Asian countries, but is slowing and even reversing in others (e.g. Kazakhstan and Kyrgyzstan, respectively) (Qi et al. 2012). In parts of East and West Africa, population pressure in humid areas is driving migration to more marginal semi-arid regions, increasing exposure (e.g. Speranza 2010). Semi-arid regions are particularly sensitive to climate variability and change due to heavy reliance on ecosystem services to support rain-fed agriculture and pastoralism (Maestre et al. 2012). The literature on semi-arid regions emphasizes the inherent sensitivity of these agro-ecosystems to climate change, particularly to changes in soil moisture (Maestre et al. 2012; Boko et al. 2007; Dong et al. 2011). This is exacerbated by severe environmental degradation and resource overexploitation, which is already driving declines in productivity, caused by growing population pressure and poor resource management (Boko et al. 2007; Fraser et al. 2011; Osbahr et al. 2008; Qi et al. 2012; Sietz et al. 2011; Speranza 2010). Many areas have already seen soil moisture decrease by a quarter, increasing sensitivity to further climate change (Maestre et al. 2012). The nature and drivers of degradation vary. In Central Asia, its roots lie in intensive monoculture production for export during the Soviet era and the removal of traditional conservation measures (Lioubimtseva and Henebry 2009). 50 % of irrigated soils in Central Asia are affected by salinization and waterlogging, owing to poor water management (Qi et al. 2012), and livestock production is in collapse, with thousands migrating in response to drought each year (Lioubimtseva and Henebry 2009). Meanwhile, overexploitation of groundwater for irrigation in large areas of northern India and Pakistan has caused cereal production to drop (Cruz et al. 2007). Livestock-based livelihoods in several regions of Africa are increasingly fragile due to rangeland degradation, competing demands on water and land and ongoing marginalization of pastoralist communities (Dougill et al. 2010; Sietz et al. 2011; Speranza 2010). It has been suggested that climate change, in conjunction with current land management practices, may cause dryland systems to cross biophysical thresholds, causing long-term decline in the provision of critical ecological services such as soil fertility and fire regulation, and hence reducing agricultural productivity and increasing exposure to risk (Cruz et al. 2007; Fraser et al. 2011; Maestre et al. 2012; Qi et al. 2012; Vetter 2009). Large irrigated areas in Central and South Asia are already affected by declining water flows (Cruz et al. 2007; Lioubimtseva and Henebry 2009), while the combination of summer droughts and cold winters in these regions is expected to increase livestock mortality (Janes 2010). Crop yields in Central Asia and North Africa could decline by 30 % by 2080 (Thomas 2008), while cereal deficits in sub-Saharan Africa could more than treble by 2025 due to climate change and population growth (Cooper et al. 2008). Droughts already have devastating impacts, for example, 14 million people were food-short in Ethiopia in 2002 (Conway and Schipper 2011). In some semi-arid parts of India, one study estimates that changes in climate have already caused a fifty per cent decline in agricultural incomes (Cooper et al. 2008). Urban populations are also vulnerable to heat waves (Gupta 2011). Adaptive capacity to deal with these pressures is often argued to be low in semi-arid regions, as they are often remote, economically marginalized and lacking infrastructure and services (Brockhaus et al. 2013; Cooper et al. 2008; Maestre et al. 2012). Cooper et al. (2008) observe that adaptive capacity is lowest in drier zones. These are often rangelands rather than agricultural areas, and particularly isolated (ibid.). Possible response strategies to address the threat to natural resource-based livelihoods include increasing inputs such as irrigation and fertilizer to fill the gap in ecosystem service provision, or improvement in natural resource management. In agricultural areas, threatened by declining rainfall and soil moisture, there will be limits to the ability of irrigation to fill the water availability gap (Cooper et al. 2008), while in several African countries including Ethiopia, the failure of effective institutional support for agriculture has engendered stagnation and limited response capacity (Conway and Schipper 2011). IPCC reports meanwhile highlight that legal and institutional frameworks in most African and Asian countries are not adequate to address resource degradation or manage climate risks (Boko et al. 2007; Cruz et al. 2007). The literature overall emphasizes that water allocation and land use are poorly managed, integrated management is not practised, and resource rights are often ill-defined, poorly enforced and insecure, in many of the world’s drylands (Brockhaus et al. 2013; Cruz et al. 2007; Janes 2010; Sietz et al. 2011). Land use planning and enforcement are weak in many parts of Asia and fail to regulate rapid urbanization (Cruz et al. 2007). In Central Asia, the land tenure system is said to be ‘in crisis’ and water management institutions are unable to regulate irrigation, in a context of severe water resource depletion, or manage transboundary disputes, which can reach crisis point during drought (Lioubimtseva and Henebry 2009). Given these limitations, the ability to diversify income sources away from agriculture is a critical dimension of adaptive capacity (Cooper et al. 2008). Willingness and ability to diversify incomes depend upon a range of factors operating at different scales: both household characteristics (size, affluence, livestock ownership, educational status, gender of household head and ability to negotiate local power relations and institutions are commonly cited), livelihood characteristics (pastoral communities generally depend on a narrower asset base) and geographical factors (such as remoteness and access to infrastructure, which are often associated with a relatively powerless social position) (Cooper et al. 2008; Fraser et al. 2011; Sietz et al. 2011; Silvestri et al. 2012; Twyman et al. 2011). Some households choose to pursue accumulation rather than diversification strategies, particularly in pastoral areas where increasing livestock holdings is seen as providing greater livelihood security; while this does provide some insurance against the effects of drought on herds, it is also risky as all assets share the same sensitivity to climate change (Cooper et al. 2008; Speranza 2010). Increases in herd size may also exacerbate land degradation (Cooper et al. 2008). Migration is an important dimension of adaptive capacity in semi-arid regions. Increases in successful pull-driven migration to non-farm livelihoods are observed by Mortimore (2010) in the Sahel (linked to increasing regionalization of labour markets), Dougill et al. (2010) in southern Africa, and Cooper et al. (2008) in semi-arid India. Push-driven migration in response to the collapse of natural resource-based livelihoods, however, can increase vulnerability. Studies from Africa and Mongolia found that wealthy herders have access to better pastures, while poorer families are being pushed into increasingly marginal areas, and sometimes out of pastoral or agropastoral livelihoods altogether, into towns (Dougill et al. 2010; Mortimore 2010; Silvestri et al. 2012; Speranza 2010). Meanwhile, the wealthy and skilled can move resources around during droughts, to reduce the severity of impacts or even to capture more land and livestock (Dougill et al. 2010; Silvestri et al. 2012; Speranza 2010). Widespread migration and instability (including herder-state conflict) in Mali have disrupted social networks, undermining adaptive capacity, and have often increased the burden on family members (usually women) left behind (Brockhaus et al. 2013). The migrants themselves are also often highly vulnerable, e.g. living in shanty towns (Janes 2010). The role of government in shaping adaptive capacity is explored in several of the articles. Dong et al. (2011) argue that ‘the collapse of the command economy has… marginalized pastoralists’ in Central Asia. However, top-down ‘adaptations’ to climate and resource shocks by Soviet and post-Soviet regimes are blamed for worsening environmental degradation and increasing vulnerability, e.g. engineering of lake levels and forced settlement of nomads (Lioubimtseva and Henebry 2009). In both East and southern Africa and the Sahel, state-supported policies that seek to sedentarize pastoralists and convert rangelands to settled agriculture or ranching limit the flexible management of livestock under climate variability, override local environmental management practices and undermine customary institutions, which have historically resolved resource-related conflicts (Brockhaus et al. 2013; Dong et al. 2011; Dougill et al. 2010; Mortimore 2010; Speranza 2010; Thomas 2008). Capacity to manage environmental risks, particularly drought, is an important governance component of adaptive capacity. Although emergency relief dominates drought response in many countries, particularly in sub-Saharan Africa (Conway and Schipper 2011; Speranza 2010), there is an ongoing shift towards pre-emptive risk reduction (Gupta 2011; Prabhakar and Shaw 2008, in India; the authors note that this is also the case in many parts of Africa). Regional, cross-sectoral institutions are emerging working on drought response and adaptation, to help strengthen policies in Africa (Conway and Schipper 2011). Across Africa and Asia, there is also increasing interest in innovations to enhance the adaptive capacity of agricultural systems, such as crop insurance and seasonal forecasts (Cooper et al. 2008; Prabhakar and Shaw 2008; Thomas 2008), water-saving irrigation (Thomas 2008) and watershed management programmes (Prabhakar and Shaw 2008), as well as social protection measures to support livelihoods and prevent destitution during difficult periods (Conway and Schipper 2011). Agro-meteorology and forecasting services are particularly important, but generally, access to these is low, and local officials often have poor understanding of climate impacts and suitable responses (Cooper et al. 2008; Tschakert 2007). However, interest in providing these skills is high in some highly vulnerable settings such as the Sahel, and past disasters have triggered some local innovation (Tschakert 2007). Investment in transport and communication infrastructure in Botswana, although not framed as an adaptation measure, has helped communities to maintain beneficial social and kin networks, which contribute to adaptive capacity, in a context of high rates of migration and urbanization (Dougill et al. 2010). International trade also plays a role in shaping vulnerability. Pastoralist sedentarization policies are driven both by a desire to impose greater control and stability in pastoral regions and by international markets for cash crops (Mortimore 2010). Meanwhile, growth in regional trade in the Sahel, as economic integration develops, is also making economic migration a more accessible strategy, and thus increasing adaptation opportunities (ibid.). Large and increasing populations in South Asian riparian countries (see Cruz et al. 2007; Gain et al. 2012; Kelkar and Bhadwal 2007) and associated rapid urbanization (Mehrota et al. 2009; Sattherwaite et al. 2007; World Bank 2010; WWF n.d.) mean that exposure to climate risks is high. Several South Asian countries are experiencing rapid economic development (Kelkar and Bhadwal 2007), and megacities such as Dhaka, Delhi and Kolkata are vital centres of growth, representing a high exposure of assets and related financial risks (Mehrota et al. 2009; Sattherwaite et al. 2007; World Bank 2010; WWF n.d.). Mountain areas face their own set of climate risks, such as glacial outburst floods, landslides, long-term decline in freshwater availability as glaciers shrink and the expansion of diseases to higher altitudes (Ebi et al. 2007). Disadvantaged groups often, though not always, face higher levels of exposure. In Assam (India), for example, many Bangladeshi immigrants live directly on river banks at risk of flood (Johnson and Hutton 2012). Sensitivity in these regions derives in part from high dependency on climate-sensitive sectors (such as rain-fed and irrigated agriculture and fisheries) for food security, employment and economic growth (Kelkar and Bhadwal 2007; see also Allison et al. 2009; Babel and Wahid 2011; Brouwer et al. 2007; Hertel et al. 2010; Johnson and Hutton 2012; Pouliotte et al. 2009). Agriculture is the single largest contributor to GDP in the region (Kelkar and Bhadwal 2007) and the main source of employment in rural areas, accounting for 70 % of the total workforce in Assam state, India, for example (Johnson and Hutton 2012, citing Planning Commission 2002). Fisheries and aquaculture are important in Pakistan and Bangladesh (Allison et al. 2009; Pouliotte et al. 2009), and pastoralism is prevalent in some areas such as the river basins of Bhutan (Johnson and Hutton 2012). Rapid population and economic growth are exerting significant pressures on natural resources in these basins, exacerbating the sensitivity of resource-dependent livelihoods and economies (Babel and Wahid 2011; Bates et al. 2008; Lebel et al. 2010; Varis et al. 2012). Increasing water withdrawals have already caused the temporary or permanent closure of numerous river basins, including parts of the Indus (Varis and Kummu 2012). In many cases, hard engineering adaptations have been applied, with mixed and unequal impacts. In Bihar, India, embankments have protected some of the population from floods but have blocked drainage and increased flood risk for others (Moench 2010). In Bangladesh, uncoordinated road-building and water development aimed at generating development benefits have, as a by-product, increased flood risk by restricting drainage, increasing waterlogging and blocking seasonal streams (Gain et al. 2012). Discussion of adaptive capacity in South Asian river basins focuses mainly on the strength of institutions and planning processes around natural resources. Transboundary water institutions are considered particularly important as many of these rivers are shared by several riparian countries, with different ambitions regarding basin development. Increasing demand for irrigation and hydropower development can generate tension between adjacent riparian states such as India and Pakistan (Moench 2010). All major rivers flowing through Bangladesh originate outside its borders, and the country is therefore particularly vulnerable to any upstream interventions (Babel and Wahid 2008). Xu et al. (2009) observed that water resource management and adaptation strategies in the Himalayan region are not yet effective in integrating the different needs of montane and lowland zones, rural areas and cities at a national level, let alone fully addressing transboundary concerns. Several of the papers reviewed here use river basins as the unit of analysis and provide some useful cross-basin comparisons of institutional strength. De Stefano et al. (2012) highlight that while transboundary agreements exist for the Indus and Ganges–Brahmaputra–Meghna (GBM) basins, providing a degree of adaptive capacity, the absence of China as a party to these agreements is an important gap. However, compared with basins in more arid parts of Asia and Africa which lack transboundary agreements, these basins are not considered particularly high-risk (ibid.). In contrast, Varis et al. (2012) find that the GBM and Indus rank as most vulnerable when compared to the South-east Asian river basins, consistent with Babel and Wahid (2008). The risk profiles of these South Asian river basins are weakest in terms of domestic governance and social dimensions and also show significant problems with the quality of environmental systems, large human footprints and water scarcity (Varis et al. 2012). Babel and Wahid (2011) argue that vulnerabilities in Indian and Bangladeshi basins are dominated by ecological and hydrological sensitivities, while in Nepal low community adaptive capacity, associated with poverty and underdevelopment, is most important, and in both Bangladesh and Nepal, weak governance and underinvestment in the water sector play an exacerbating role. Significant variation is also seen in the drivers of vulnerability between sub-basins, linked to both socio-economic factors (including literacy and the extent of employment in agriculture), and geography (for example, the middle hills in Nepalese basins are more favourable for human settlement and agricultural production, but therefore also experience high population pressure on resources) (Pandey et al. 2010, 2011). Perhaps due to the focus on ‘river basins’ as the hot spot, which led to a preponderance of document search results focusing on water management capacity, there were relatively few studies in this hot spot which took a livelihoods-based or community-level view of vulnerability. Few explored in depth the role of multiple stressors in shaping vulnerabilities, even when studies on such themes were specifically sought out in the second round of literature searching. However, as in the other hot spots, livelihood diversification is a critical adaptive strategy and the prospects for diversification are shaped by a range of environmental, political and economic factors. Natural resource management practices again emerge as critical; in Sunbarnabad, Bangladesh, Pouliotte et al. (2009) highlight how a shift from agriculture to shrimp farming has reduced access to common pool resources, driven a deterioration in water and soil quality and eroded traditional safety nets, reducing adaptive capacity for the poorest groups in particular. Pandey et al. (2011) argue that in Nepal, community-based conservation programmes have, in contrast, led to increased resilience. However, others question whether exposure may still overtake such adaptive capacity as new adaptation is increasingly required to take place ‘outside the range of human experience’, requiring more transformational approaches (Lebel et al. 2010: 356). Several vulnerability drivers are common to the three hot spots. All are characterized by high levels of dependence on natural resources for livelihoods and economic development, combined with increasing environmental degradation, which can both increase exposure (e.g. mangrove destruction increasing coastal flood risk) and reduce adaptive capacity (e.g. declining river flows constraining delta farming and fisheries) (Nicholls et al. 2007; Swain et al. 2011; Tekken et al. 2013). In this context, the poorest are usually in the most fragile position, as they are often most directly dependent on natural resource-based livelihoods and have fewest options for diversification or migration. However, poor groups often possess informal coping mechanisms such as credit arrangements (Brouwer et al. 2007), early warning systems (Moench 2010), migration and mobility (Brockhaus et al. 2013; Speranza 2010; Xu et al. 2009), adjustment of crop and fishing seasons (Cinner et al. 2012; Nzeadibe et al. 2011) and sharing of traditional knowledge (Dossou and Glehouenou-Dossou 2007; Goulden et al. 2009; Rao 2013). These provide a level of adaptive capacity, which may go unrecognized by both policy-makers and by more impact-led research (Brouwer et al. 2007; Pandey and Jha 2012). Some authors, however, emphasize that existing coping mechanisms or gradual adaptations are likely to be insufficient given the rate and scale of predicted climate changes in the region (e.g. Xu et al. 2009), implying a need to support communities to transform their livelihoods (Lebel et al. 2010). High levels of poverty, and associated factors such as poor health, lack of political voice or ability to negotiate power relations and limited access to resources, technologies and networks, are frequently cited as sources of vulnerability in all three hot spots; indeed, this was a reason for the selection of these hot spots for analysis. Significant group-based inequalities are also reported in all hot spots, based on gender, ethnicity, livelihood or immigration status (Dougill et al. 2010; Glazebrook 2011; Hassani-Mahmooei and Parris 2012; Janes 2010; Johnson and Hutton 2012; Seto 2011; Silvestri et al. 2012). It is critical to understand the processes by which poverty and group-based marginalization (the systematic marginalization of particular social groups, for example, ethnic groups, castes or immigrants) are created and maintained. Satterthwaite et al. (2007) argue that though the vulnerability of low-income populations is often ascribed simply to poverty, ‘it is far more the result of government failures and limitations’ (p. 2), a view echoed by Mortimore (2010) who cites a frequently found ‘disabling environment’ for adaptation. Indeed, in all three hot spots, unequal policies and patterns of development, driven by national and regional political and economic priorities, are benefiting certain segments of society while making others more vulnerable. In deltas, rapid development has often centred on the service and industry sectors at the expense of small-scale agriculture and fisheries (Malm and Esmailian 2012; Nzeadibe et al. 2011; Sall et al. 2011; Tschakert 2007). In the South Asian river basins, water resource management decisions often take little account of poor water users, who have limited ability to influence these processes (Pouliotte et al. 2009; World Bank 2010). Varis et al. (2012) point to the ‘agglomeration of poverty, malnutrition and uncontrolled urbanization’ (p. 441) in river basins such as the Indus and GBM. 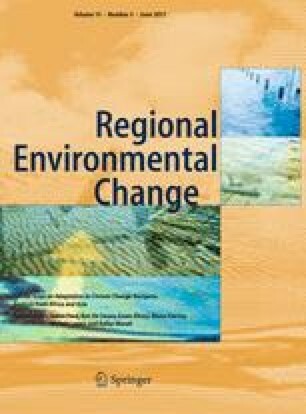 Meanwhile, in semi-arid Central Asia, East Africa and the Sahel, policies of sedentarization and changes in pasture management increase the vulnerability of pastoralists (Janes 2010; Lioubimtseva and Henebry 2009; Speranza 2010; Thomas 2008; Thornton et al. 2009). Mortimore (2010) argues that semi-arid regions such as the Sahel are undergoing long-term socio-economic transformations that have both positive implications (e.g. better access to education) and negative ones (e.g. loss of customary institutions). In South Asia, rapid economic growth has contributed to employment and incomes associated with an expanding middle class, yet industrial development has exacerbated problems of water scarcity and water quality (Cruz et al. 2007). Many studies highlight a tendency of policymakers to favour hard infrastructure ‘adaptations’ to climate risks and note that these may have unintended adverse consequences. However, Sovacool et al. (2012) observe some softer, more contextually grounded approaches in parts of Asia, for example, coastal afforestation programmes to alleviate flood risk and community-based information systems on floods and droughts. There are also positive stories of government investments reducing vulnerability, however. Dougill et al. (2010) cite the role of free primary schooling and government provision of roads and health centres in Botswana in reducing vulnerability, while Conway and Schipper (2011) highlight the growth of social protection programmes. In Bangladesh, community engagement in planning and risk management has helped to reduce the impact of flooding, although efforts have tended to focus on emergency relief rather than longer-term resilience building (Babel and Wahid 2011). There are instances in all hot spots of exposure to extreme events and negative climate change impacts triggering adaptation at all levels, from households to national governments, suggesting that learning is occurring. Overall, adaptive strategies by communities and households are mediated by both formal institutions (such as resource rights regimes) and social relations, so the strength of both is an important dimension of adaptive capacity. The articles identified approach vulnerability at different scales, from global overviews to community-level studies. In the second round of literature identification, an effort was made to ensure coverage of all scales of analysis in each hot spot: global, regional, national, city and community. Overall, 15 articles are considered global in scale, 24 regional, 17 national, 6 city scale and 25 community scale. Online resource 5 summarizes the frequency with which different vulnerability factors are identified in articles focusing at different scales. Some factors are frequently identified across all scales (in particular poverty, access to natural resources, livelihood opportunities and health and education status), while others show a different pattern. Macroeconomic measures, institutional capacity, spatial planning and demographic trends such as population growth and urbanization are infrequently mentioned in community-level studies, but arise frequently in analysis at other scales, for example. Access to information and technology, social networks and individual characteristics such as age and gender show the reverse pattern. Vulnerability plays out locally but is driven by a suite of factors at different scales (see Smit and Wandel 2006). Local environmental conditions, economic opportunities, institutions and social relations are critical, but are rooted at least partly in national level decisions (e.g. national economic policy, resource allocations and infrastructure priorities) and international or global relationships (trade, transboundary resource management and migration policies for example). Many studies reviewed in this paper are strictly large scale (e.g. broad comparisons of vulnerability across countries) or local (documenting household decision making and community-level processes). These are both important starting points, but advancing our understanding of social vulnerability requires dynamic analysis of the interactions between international, national, subnational and local forces, in specific locations. Duerden (2004) has identified a common mismatch between the large scale at which biophysical impacts of climate change are typically studied and the local scale of most analysis of community responses; this review to some extent confirms this. Several of the papers reviewed made this case (Bunce et al. 2010b; Manandhar et al. 2012; Mortimore 2010; Twyman et al. 2011), and this is not a new insight in the wider literature, but characterization of these interactions is, in general, not particularly well developed in the climate-focused literature on these hot spots identified by this review. This is particularly true in the case of deltas and glacier-fed river basins, possibly because the priority attached to space- and time-limited effects such as sea-level rise and flooding has led to a greater focus on identifying exposed people and infrastructure rather than on understanding detailed patterns of vulnerability to longer-term impacts. Research by Pouliotte et al. (2009) and Bunce et al. (2010a) are two exceptions. In semi-arid areas, such interactions receive a little more focus. Janes (2010), for example, highlights how the interaction of regional economic forces, national policy and household characteristics shapes vulnerability in Central Asia. In the wider literature, some authors have taken steps towards developing linked indicator sets for vulnerability analysis at different scales (e.g. Vincent 2007) and attempted to bridge scales qualitatively using a broad-based political economy approach, which recognizes the interconnections between them (e.g. Adger et al. 2009a; Eakin et al. 2009; Ford et al. 2013, and others by these authors). The hot spots used have some value as a scale of analysis for social vulnerability due to their basis in shared environmental characteristics, especially in relation to natural resource-based livelihoods. A hot spot approach may also enable useful links to be made with biophysical analyses of climate impacts, if these are developed on the basis of ecological and climatic zones. Large biophysical zones do not line up with social, economic or political systems, however. For example, the Karachi area is economically dependent on the Indus basin, but lies outside its hydrological boundaries (Varis et al. 2012). There are also geographical overlaps between the selected hot spots. Hot spots thus provide a useful layer of analysis, but their explanatory power should not be overstated. Several of the reviewed articles also identify geographical zones within hot spots as having different vulnerability profiles, for example highlands, midhills and lowlands in glacier-fed river basins, and wetter (usually agricultural) versus drier (usually pastoral) semi-arid zones. Xu et al. (2009) argue that urban/rural differences are so great that the city scale is crucial for vulnerability assessment and adaptation. Several of the reviewed papers on South Asia highlight distinct characteristics of urban vulnerability, pointing to huge population densities and insanitary conditions (World Bank 2010), unregulated urbanization with inadequate land, housing and water rights (Sattherwaite et al. 2007), failure to provide basic infrastructure and flood protection in slums (Mehrota et al. 2009; Varis et al. 2012), and inadequate profitable jobs for migrants from rural areas (WWF, n.d.). However, urbanization also offers opportunities, and several authors note that urban areas—particularly large ones—possess a certain resilience due to their connections to national and international economies and knowledge networks, and the fact that they are often prioritized for investment (Mehrota et al. 2009; Sattherwaite et al. 2007). While adopting an urban or rural perspective, however, critical interactions between them, such as flows of labour, resources and knowledge, should not be neglected. These interactions were not explored in much detail in the climate change literature reviewed here, although some authors observe that distance from urban settlements, linked to access to infrastructural services or markets, shapes rural vulnerabilities (see Pandey and Jha 2012; Johnson and Hutton 2012). Different scales of analysis make sense for different climate impacts. Some hazards occur in specific locations (e.g. riverine floods), while others are more generalized (e.g. temperature rise or changing rainfall seasonality). Exposure to the former is driven in part by location, and visible spatial inequities are often at the heart of vulnerability, although sensitivity and adaptive capacity vary significantly among those exposed. Moreover, there can be a locational trade-off between exposure and access to resources—for example, in Pakistan districts close to rivers and hence most exposed to flooding, also benefited from more fertile land and better infrastructure (Khan and Salman 2012). In the case of more ambient impacts, vulnerability may be more distributed spatially, even if its underlying drivers—related to poverty and exclusion—are similar. There is also a difference between time-bound incidents, which ‘result in an immediate need for an alternative [livelihood]’, (Johnson and Hutton 2012) and gradual changes requiring longer-term adaptation, although biophysical and social thresholds may be involved in the latter (Dougill et al. 2010). Different impacts may be more important in different places: for example, Johnson and Hutton (2012) contrast Assam as a ‘hazard dominated’ society where localized flooding is the primary risk, with Bhutan where the main concern is monsoon delay. However, there may also be a risk that long-term gradual changes are neglected in places where immediate hazards are highly visible. Finally, the household scale is critical for understanding vulnerability. Numerous articles point to differences between households shaping differential vulnerabilities, typically linked to wealth (income or asset ownership), but also to do with household size, gender of the household head, educational status and power or voice (e.g. Brockhaus et al. 2013; Brouwer et al. 2007; Khan and Salman 2012; McGranahan et al. 2007; Speranza 2010; Tekken et al. 2013). But households are embedded within communities and larger units, and adaptive capacity at one scale may to some extent compensate for vulnerability at another; effective prevention and relief activities by government or local institutions can mitigate a lack of household-level preparedness for hazards, for example. Where vulnerability drivers at multiple scales combine, the threat is greatest; for example, Brouwer et al. (2007) found that the people most exposed to flood risk in Bangladesh were also the least likely to have put in place preparedness measures at a household level, and least likely to have benefited from community-level relief efforts, representing a triple vulnerability. The reviewed literature explicitly identifies certain research gaps. First, a need for greater understanding of the complex two-way interactions between climate change impacts on natural systems and socio-economic trajectories, including adaptation measures (Akinro et al. 2008; Bates et al. 2008; Nicholls et al. 2008b; Pandey and Jha 2012; Tekken et al. 2013; Vetter 2009; Xu et al. 2009). Bates et al. (2008), for example, ask how climate change effects on the hydrological cycle and on water demand will together affect water resources. Vetter (2009) asks how socio-economic and environmental change in the South African rangelands will interact to shape future vulnerability. Pandey and Jha (2012) suggest that new methods for vulnerability assessment may be needed to answer such questions. This is in line with calls in the wider literature for research to bring together what we know about endogenous and exogenous drivers of vulnerability, and insights from the natural and social sciences (e.g. Duerden 2004). Second are calls for greater understanding of the underlying drivers of vulnerability and how and why they change over time. This includes a need to capture the interaction of multiple stressors (Bunce et al. 2010a, b; Cruz et al. 2007; Westerhoff and Smit 2009), incorporate longer-term socio-economic trends into vulnerability analysis (Gain et al. 2012), and recognize that households respond to climate change in dynamic, nonlinear ways (Thornton et al. 2006). Several authors highlight a lack of good understanding of what shapes patterns of urbanization and subsequent vulnerabilities in specific towns and cities (McGranahan et al. 2007; Sattherwaite et al. 2007), and of the effect of changing rural–urban relationships on rural vulnerability (Johnson and Hutton 2012). Johnson and Hutton (2012) also argue that our methods for system-level studies of urban vulnerability are insufficiently developed. Some specific understudied livelihood systems are also mentioned. Allison et al. (2009) highlight that little research exists on the impacts of climate change on small-scale fisherfolk and associated workers, and that suitable indicators and pathways for analysis have not yet been identified for this sector. Finally, the need for greater understanding of the role of ‘social stratifiers’ (e.g. gender, ethnicity, age) in vulnerability was noted (Glazebrook 2011). Some knowledge gaps were also evident to the authors surveying the literature during both document selection and analysis. In general, analysis of social sensitivity and adaptive capacity appears to be less developed than that of responses to climate change by natural systems, as asserted by authors including Ericson et al. (2006) and Nicholls et al. (2007). Particularly in the case of deltas, the literature was dominated by assessments of exposed populations and assets, rather than analyses of social drivers of vulnerability. In semi-arid regions, few studies were found which focused on urbanization or urban issues. There are also few studies which draw lessons across continents. In river basins, there was limited analysis of the pathways by which transboundary water management shapes vulnerability, although its importance was repeatedly stated and is increasingly recognized elsewhere (e.g. Milman et al. 2013). Due to the focus of this review on climate-related literature, the studies included mostly adopt concepts and frameworks from the field of climate change impact assessment. The climate change community has historically paid much greater attention to characterizing biophysical impacts than socio-economic responses, and it appears that, for the most part, this literature does not treat social vulnerability in sufficient depth. Attention to the effects of national development strategies and macro-economic policy in the identified literature is also very limited. How will emerging policies such as ‘green growth’ strategies (aimed at achieving multiple wins for development, adaptation and sustainability) shape vulnerabilities, for example? With some notable exceptions, the climate change literature identified for these hot spots has not yet benefited from strong potential synergies with the in-depth, context-specific social, economic and institutional analysis often found in the wider development or poverty literature. The three hot spots studied in this analysis exhibit certain specific social vulnerability features, linked ultimately to their ecological and physical characteristics and the opportunities and constraints which these have created for development over time. Each shows a somewhat distinct development pattern, notwithstanding substantial differences between locations within each hot spot. Across the three hot spots, common sensitivity factors that emerge strongly from the review are the high levels of people’s livelihood dependence on ecosystem services and the existence of development pathways that are either reliant on natural resources or placing strain on provisioning, regulating and supporting ecosystem services. The literature analysed in this review, with its explicit climate focus, sheds considerable light on broad patterns of vulnerability across the hot spots and is useful for drawing conclusions at this macro-scale. Some insights are also gleaned into particular contexts from detailed local studies. Limited access to livelihood resources is frequently cited as a fundamental source of heightened vulnerability, and unequal policies and patterns of sometimes very rapid development are benefiting certain segments of society while making others more vulnerable. Adaptation research must recognize the close links between poverty and vulnerability, and the complex ways in which these links develop in specific locales. In cases where vulnerability drivers at multiple scales combine, threats may be even greater as differences in exposure, sensitivity and adaptive capacity cascade to produce multiple vulnerabilities. Political, economic and social dynamics not directly linked or geographically aligned to the hot spot type are also important. Carefully structured analysis is therefore needed to fully capture the interaction of multiple factors operating at different and/or multiple scales and their role in shaping the exposure, sensitivity and adaptive capacity of different people in specific contexts. Research gaps identified also concern the need to focus on linkages between impacts on natural and social systems, across multiple stressors and between underlying and proximate drivers of vulnerability. Other gaps relate to the scope of this review of climate-related literature. Five distinct approaches to vulnerability analysis were identified in the reviewed literature, which provide different and complementary insights. Drawing on several of these in combination, together with approaches established in other fields, offers a promising way forward to address research gaps and further develop our understanding of vulnerability in these regions. This work was carried out under the Collaborative Adaptation Research Initiative in Africa and Asia (CARIAA), with financial support from the UK Government’s Department for International Development and the International Development Research Centre, Ottawa, Canada.